Home | Vinyl Siding Styles | Wood Siding Styles | Engineered wood: comparable to vinyl siding cost? While most families don't mind spending a little to make the exterior of their homes as attractive as possible, sheds and barns can be another matter. If the structures are situated where they don't detract from your house, using a more budget-friendly exterior siding can be a good way to save some money when doing a little renovating. Engineered wood siding has been a long-time favorite due to its price and durability, but is it really that much cheaper than that beautiful vinyl siding on your home? Material -- Expect to pay about $2.43 a square foot for 5/8 inch thick cedar siding that has been factory stained. A vinyl siding in a .042-inch thickness should cost about $0.84. 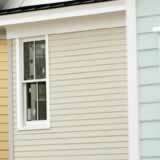 Installation -- Engineered siding costs about $0.98 a square foot for installation and vinyl about $1.34. Sheathing -- You do not need it with engineered siding, but expect to pay about $1.53 a square foot for the material and installation as a base for vinyl. The grand total is $3.41 for engineered wood and $3.71 for the vinyl. The wood siding is factory-stained, but typically you can expect it to cost about $0.48 a square foot every several years when you spray it with two coats of stain to maintain its appearance. When you look at all the numbers, vinyl siding cost can be very competitive. The most attractive material might also be the most budget-friendly choice for your barn or shed.